President Bone, above left, and Warren Harden watched Governor Otto Kerner sign the University’s name change into law on August 23, 1963. More than four decades have passed since Robert Gehlmann Bone served as Illinois State’s ninth president, and yet he is far from forgotten. His legacy as an exceptional educator, administrator, friend and family man is still appreciated on campus—especially during the celebration of Founders Day each February. The annual day of reflection inevitably leads to praise and respect for Bone’s efforts and ability to move ISU forward. The decisions he made during his decade as president positioned Illinois State to become the University it is today. Bone took office in 1956, just as the University was beginning its second century. The campus had grown to 25 buildings and enrollment was near 3,000. When he retired in 1967, Old Main had been demolished. New construction totaled 15 buildings and 10 additions. The work, completed at a cost of $60 million, tripled the campus class size. 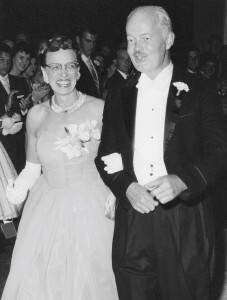 The campus welcomed President Robert Bone and his wife, Karin, at an inaugural ball in October 1957. The student body swelled to nearly 13,000, with the number living in residence halls jumping from 1,032 to 5,070. Six administrative units were created and doctoral programs added as the institutional mission shifted from strictly teacher education. The new direction was cemented when the name was changed from Illinois State Normal University under Bone’s watch. More impressive than the fact Bone navigated a restructured, repurposed, and revitalized institution with a soaring enrollment and expanded reputation was the way he accomplished the feat. Despite such monumental and often contentious changes, Bone made Illinois State a warmer, friendlier place. “President Bone was the kindest, most empathetic man I have ever known,” said Syracuse Chancellor Emeritus and Distinguished Alumnus Kenneth “Buzz” Shaw ’61, who was awarded an honorary degree from ISU in 1987. Others who knew Bone and his wife, Karin, concur that outreach was their forte. A consistent presence at university events, the duo had an infectious friendliness, sense of humor and enthusiasm. “He genuinely liked people and believed it was important to connect with them on a personal level,” said Roger Cushman ’62. Now retired from his position as ISU’s director of Media Relations, Cushman was an undergraduate when he met Bone. He knew Roger’s name and spoke as if they were already friends. “He was distinguished in appearance, dignified in manner, yet down to earth and utterly without pretense. He was affable, friendly, warm, and possessed a great sense of humor,” Cushman said, recalling how Bone stood out at Redbird games in his red vest, matching socks and a bow tie. Bone had such a welcoming manner that he would wait until the campus was full of students before taking a regular morning walk. Distinguished Alumnus James Fisher ’56, M.S. ’57, still recalls struggling to keep up with Bone on those jaunts across the Quad. Many were shocked to have Bone help them move into a residence hall, which was just one of many ways he exemplified his belief in lending a helping hand wherever possible. Such demeanor resulted in students adoring their president. “Twice they thronged the Quad to give him surprise greetings,” Cushman recalled. “Once on his return from abroad to the tune of ‘Hello Dolly’—substituting the words ‘Hello Bobby’—and another time on his birthday.” It was a milestone celebration as he reached 60. “Dust Up Your Shakespeare” during a campus talent show. Bone’s campus persona was a genuine representation of the man he was at home, according to the youngest of two sons, Robert “Chip” Bone Jr., M.A. ’82. That fact was just one trademark of Bone’s life, which began in Springfield in 1906. He grew into an inveterate traveler, lifelong educator and global citizen. Soon after graduating from Wooster College, he led student trips around Europe. He lived and taught for three years in Alexandria, Egypt. Upon returning to the U.S., Bone completed a master’s at the University of Illinois, where he also earned a doctorate. During WWII he completed officers’ training school in the Army Air Corps and went on to train pilots in Texas. Bone married Karin in 1944. That same year he journeyed overseas again as a member of the Headquarters Staff of the U.S. Forces in Europe. It was there he helped found the American University at Shrivenham, England, where he served as head of the history department. Bone held administrative positions at the University of Illinois as well, where he taught for 20 years and was so loved by students they voted him the “most popular teacher on campus.” He was assistant to the provost when he accepted the presidency at Illinois State. “His greatest legacy was allowing change,” said former Vice President of Finance and Planning Warren Harden. He points to Bone’s ability to build consensus from a position of neutrality on the most contentious issues as integral to his success, even as his own personal convictions were rudder and compass to progress and change. While many of the campus old guard were committed to the Normal school focus on education, Bone saw a brighter future for a diversified, liberal arts university. He foresaw change and above all, remained committed to the students. They ultimately were decisive in helping advance his goals. “He encouraged students to participate and be heard, take an active role and join campus committees, the Vidette, and other organizations to make their opinions known,” Harden said. Their involvement was especially crucial to the debate surrounding the University’s name change. Harden worked closely with Bone on the issue as a faculty member in the Economics Department and president of ISU’s American Association of University Professors chapter. Changing opinions was a slow and deliberate business. Bone consequently insisted that all campus opinions be heard and varying perspectives examined. The campus debate stretched from 1959 until the change was approved in August of 1963 by then Illinois Governor Otto Kerner. 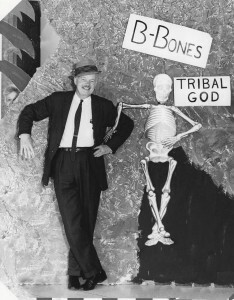 A light-hearted soul, Bone showed his humor posing with a theatre club performance set in 1960. By the time it took effect on January 1, 1964, the accomplishment left many in awe of Bone’s ability to maintain civility and restore unity while moving the University forward so significantly. “I think all of his goals were realized,” said Chip, who is pleased that his parent’s legacy remains strong on campus so many years after his father’s presidency and death. 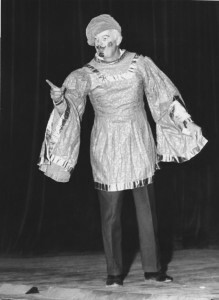 Bone died in 1991 at the age of 84. Karin lived another six year to the age of 89. The University still recognizes the top undergraduate students as Bone Scholars, the Karin Bone Athletic Study Center serves student-athletes, and the Bone Student Center was so named to honor the couple’s dedicated service to Illinois State. 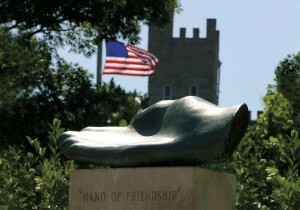 The Bone Hand of Friendship on the Quad.